British Animator/Illustrator Julia Pott has become a staple of film festivals over the past several years, garnering critical acclaim and awards for her short animated films. 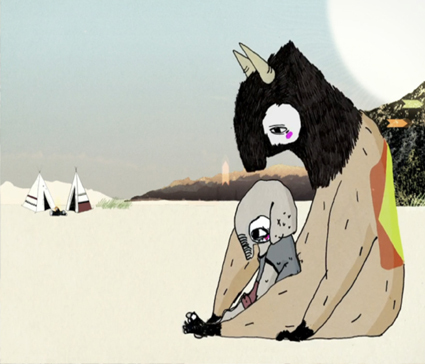 Pott’s films are an anthropomorphic reimagining of life, using strange imagined animal like characters rendered in her disarming/inventive illustration style which carries her unique voice to actually make you feel, her stories often funny and sometimes painful search for something intimate and real. Pott’s films include stops at Sundance, Animaest Zagreb, SXSW, The Holland Animation Film Festival and many other international festivals. Pott’s now lives in Brooklyn, NY and is working at Hornet. She graduated from Kingston University UK and has an MA in animation from the Royal College of Art London England. Pott’s was named as one of the top three animators to watch for in 2013 by Creative Review. Join us for the Gala Opening Reception Fri. Feb 13 @7-10pm featuring a ferocity of art with 3 new exhibitions and special one night only musical performance by Nancy Pants of Montreal-[w/Adam Waito of Adam & The Amethysts/Miracle Fortress] Lots of catered and cool winter refreshments, artist talks and more!